When you are recording drums at home, you can produce amazing drum recordings if, you learn a few drum recording techniques. On this page you will learn some recording techniques that will give you a better understanding of how to record drums in your home recording studio. How many microphones should you use? What type of microphones? Where should the microphones be placed? What type of microphone pattern is best? How should the room sound and how will it affect the recording? Do you need to be recording drums at home or, is software better to use for drum sounds? All these will be answered plus there are some drum recording tips. First thing is to tune the drums and maybe put new drum heads on the drums. If the drums sound good in the room then the drums will sound good when recorded. Make sure the stands and mounts don't rattle and, if they do then stop the raddle before you record. The room will influence the recorded sound of the drums. A lively room will produce a big full drum sound. When recording drums at home the best way to record the drums is to use two overhead microphones these record the entire drum kit in stereo. Then have spot mics for individual drums and cymbals. The best type of mic to use for the overhead microphones are large diaphragm condenser. You can use the x-y placement technique by placing the mics about 1 to 2 feet above the drums and just in front of the drummer. Or you can use the stereo placement technique where the mics are placed up to 6 feet apart and 2 feet above the drums. The best mic to record the bass drum is a dynamic microphone. You can place the mic inside the bass drum by removing the outside drum head. Placing the mic about 3 inches away from the inside drum head and a little off center will give a quick attack sound from the beater hitting the head of the bass drum. Placing the mic in the center of the bass drum will give more body in the drum sound and less attack. With the outside drum head on. Placing the mic 3 inches away from the head and centered will produce a open, boomy sound. Placing the mic off center and facing slightly away will produce less open and a less boomy sound with more overtones. The best microphone to use to record the snare drum is a dynamic microphone like the shure SM57. Place the mic about 2 inches away from the top head at the edge of the drum angled toward the head with the diaphragm pointing at the head. This placement will give a full punchy sound which is ideal for the snare drum. Again the dynamic microphone is the best to use. For the best sound and control when mixing, record each tom-tom separately. Place the mic up to 3 inches above the rim of the drum with the mic pointing toward the head. You can use one microphone placed between two tom-toms placing the mic about 6 inches above the rim and pointing between the two drums. For more boom and less attack the mic can be placed inside the tom-tom. Floor tom-toms are miked the same way as mounted tom-toms. A small diaphragm condenser can be used for the hi-hats placed above them and about 4 inches away will produce a nice bright sound. For a rougher sound use a dynamic mic placed in the same position. A small diaphragm condenser can be used for cymbals to produce a good recorded sound. Place the microphone about a foot above the cymbal and pointing toward the cymbal. The overhead microphones can be used to record the cymbals but by miking the individual cymbals you will have more control when mixing. Above all else remember that these are guide lines not hard and fast rules, then recording drums at home. So the name of the game is experiment, try different positions, try different type of microphones, one way isn't right for all. And if all else fails or you just don't have a drum set, or a drummer for that matter, you can always revert to using software for your drum kit. The software versions are so good that it is getting hard to tell them from the real thing. And they don't take up so much room. 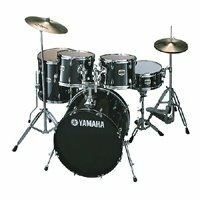 But if you are lucky enough to have drums and a drummer, when you are recording drums at home, you can get some good recordings using the techniques on this page but make adjustments to get the sound you want.